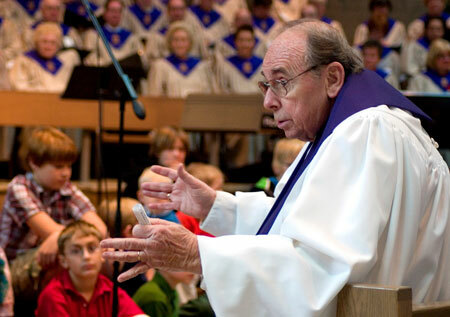 The late Reverend Francis Park served Pinnacle as a Pastoral Associate for nine years, until his death in 2011, focusing on senior adult ministries and education. It was his inspiration that led to the founding of the Pinnacle Theological Center in 2003. Seeing the need in Phoenix for high quality theological education for both laity and clergy, he envisioned the dynamic approach that we are developing today. The Fran Park Memorial Lecture was established with memorial funds in his honor in 2012. After a generous financial pledge from a Pinnacle family in 2015 made possible the unfolding we are seeing today, the leadership of Pinnacle voted to rename the Theological Center in his honor, to become the Fran Park Center for Faith and Life. Prior to serving at Pinnacle, Fran was the senior pastor of Faith Presbyterian Church in Sun City where he had served for fifteen years. At Faith, Fran developed a nationally recognized seminarian training program in senior adult ministry, served on the ethics committee of a major medical system, and was a Trustee of Pittsburgh Theological Seminary. Also notable in his ministry were years spent in ministry in Columbus, Ohio. He was as committed to the local church as he was to the denomination, serving ably on national committees to strengthen the church and its mission.